Huge congratulations to Rachel for a very successful first year of triathlon. 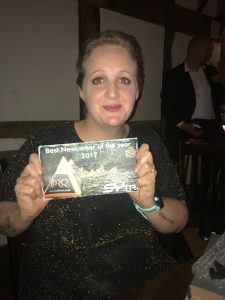 Last month Rachel was voted “Best Newcomer of the Year” by SYtri (Shrewsbury Triathlon) club members. 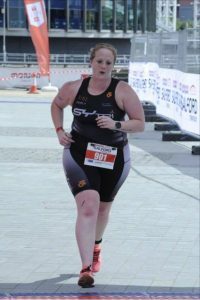 Rachel threw herself into triathlon training in January, with the aim of completing her first triathlon, Salford Sprint Tri, in July. 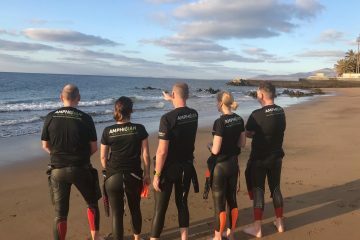 Although Rachel enjoyed running, she was new to road cycling, and could only swim a few lengths of front crawl continuously. 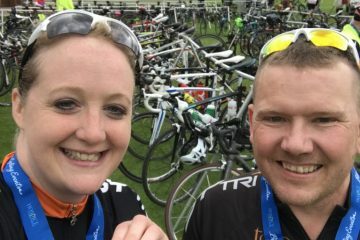 During this time, she was also building up her bike mileage and skills, and known for not doing things by half, Rachel completed Chester Sportive, a 40km bike ride in June – not bad considering she hadn’t ridden a road bike before January! At the same time Rachel continued to build her running skills and completed Shrewsbury 10km in March & Market Drayton 10km in May, where she was 3 minutes faster. Parkrun was also included in the plan – she got faster by over 9 minutes between January and April! 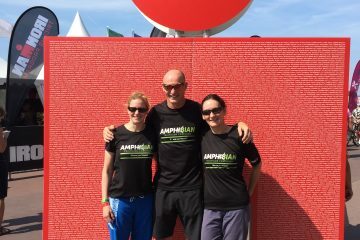 The final challenge before Salford tri was to conquer open water swimming – something very daunting for most people. Although Rachel was apprehensive at first and initially “enjoyed” drinking the water, she took to open water very quickly and was happily swimming around Walford Lake within a couple of sessions! By the time Salford Triathlon neared I was certain Rachel would be more than able to successfully complete the 750m open water swim, 20km bike & 5km run. With a week to go, race day nerves kicked in giving Rachel doubts, but with her determination and the support of those around her she got to the start line raring to go – once the race started there was no stopping her. She came out ahead of many in her swim wave, and handled the technical bike course well, even avoiding an artic lorry blocking the course at one point! The run was to be the hardest part, with lots of twists and turns making it difficult to get into a good rhythm. Nevertheless, Rachel persevered and was rewarded along the finishing straight with massive cheers from friends, family and SYtri club members. After achieving all that, Rachel went on to complete Nantwich Sprint Tri & Shrewsbury Tri (a river swim) in quick succession, not to mention having a short holiday before upping her training again and completing Vyrnwy half marathon in September & achieving a PB marathon time at Birmingham Marathon in October. As Rachel’s coach this year I have followed her journey closely, and been hugely impressed by her hard work and desire to do the very best she can in what she does (even when she gets so keen and “accidentally” enters any extra race that comes up!) There is no doubt Rachel’s enthusiasm & determination saw her through the challenges and little mishaps along the way, including having to fit all the training and numerous races around a very busy work schedule and the demands of family life. I’d say the “Best Newcomer Award” was well and truly deserved, and can’t wait to see what she decides to do next year to top that!